Gracilis ! Gracilis ! Gracilis ! or Slender Weavers Bamboo seems to be THE Bamboo plant that everyone is chasing these days. Most phone calls are for it, most of our nursery is growing it and most of our trucks leave here full of it . So why the attraction to this over other species of Bamboo? After all we have over 100 species to choose from. 10 years ago no one knew about Gracilis and other species were the big sellers. First of all is its climatic range and general hardiness , it grows almost everywhere , being tolerant of heat and the coldest of Winters. Gracilis is also very drought hardy which is important for low maintenance gardens. Gracilis has no pests or diseases and grows well for even the most inexperienced gardeners. It also seems quite OK in coastal locations . Next reason for this plants popularity is its beautiful upright habit . It has the most vertical form of all the bamboos. So you get maximum height and screening without losing too much of your backyard space. Gracilis is adaptable. It can be planted into smaller spaces where nothing else will fit and with its vigour and upright habit will still reward you with generous growth. 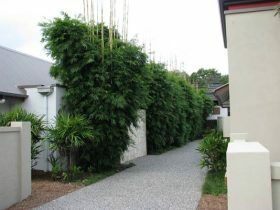 We have seen 200mm pot sized plants squeezed into a 200mm gap between a driveway and a fence and the plants still grew to 4 metres tall and looked fantastic. Most people plant it along a fenceline for a super fast neighbour break! (we hear some horror stories about neighbours, it seems not all of them are kind , quiet and considerate). The rule of thumb generally applied to spacing is one plant per metre , at this spacing plants will grow into each other quickly forming a continuous line of upright culms (poles). This is really an economical solution when you consider that the cheapest of fences cost about $120 per linear metre , look ugly and don’t really do much to improve privacy. Also timber fences will never look better than the day they are installed and start to deteriorate from that day onwards. Gracilis Bamboo can cost just $29 per metre (+gst) and only improve with age getting thicker and lusher and enhancing the environment and improving the quality of the air you breathe (remind me to put the price up, hahaha!). At 6-8 metres tall Gracilis is the best Bamboo to screen out a 2 storey building next door. Gracilis is evergreen with no yellow foliage over winter. I often describe its appearance as like roll out bamboo fencing , but alive . So, how fast for the desired results? Here on the farm when I plant one single pole in a 200mm pot into the ground in Spring by the same time next year I’ll usually have a plant 3-4 metres tall with 10 -15 culms each. 12 months growth from very little to 3-4 metres is impressive. Next year the same plant will be a 5 metre plant with 25 or so culms. These results can be improved by starting with a larger plant eg. a 400mm should give good privacy within 12 months. As with all Bamboos the best treatment is plenty of water during the summer months (growing season) and a good heavy layer of mulch to suppress competitive grasses at planting time. Any high nitrogen fertiliser is good. Not too much on young plants , read your labels and apply appropriately. The current trend in housing seems to be ever smaller house blocks or units with people living in closer proximity. 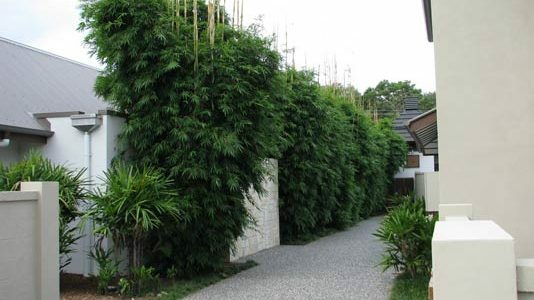 Our clumping bamboos are proving to be the ultimate solution for giving people back some instant privacy and fast growing greenery.